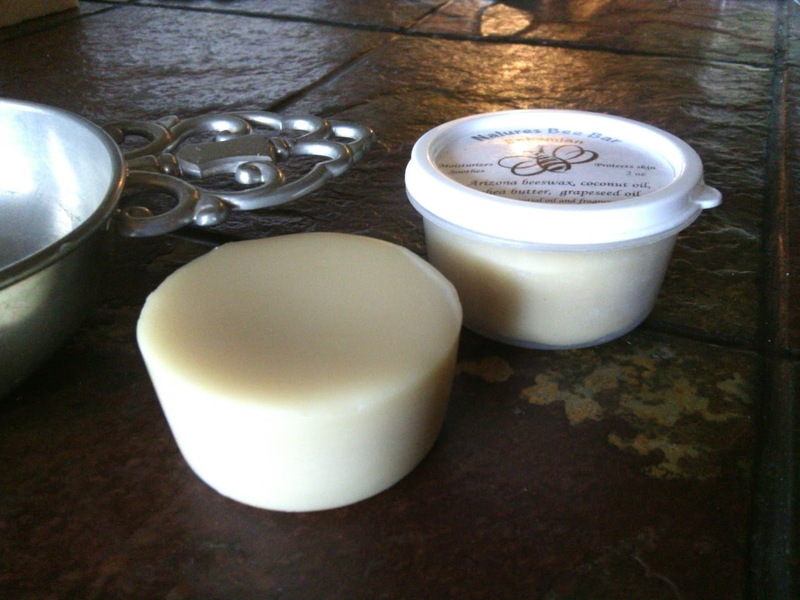 Updated: 9/6/16 Solid lotion bars are a rich combination of skin loving oils, butters and beeswax formulated into a convenient bar that is solid at room temperature, but melts on contact with your skin. These little gems deposit a concentrated moisture packed punch that is unbeatable. Once you try one, you will not want to be without them. I am going to show you how to make these treasures yourself out of all natural, easy to find ingredients. A beautiful addition in natural skin care for yourself and your families needs. You will need 3 ingredients, plus an essential oil or a fragrance if you want it scented, and small molds, tubs or tins to pour lotion into. and, essential oil or skin safe fragrance oil of choice. heavier and have a greasier feel than others for example. 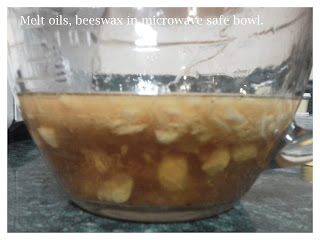 Put beeswax into bowl you will be melting in. Add the grapeseed oil and coconut oil. Put into microwave and begin melting. Once you see the beeswax start to melt, stir, stir, stir. This helps it to melt faster into the oils without using too much heat. Put back into the microwave at 20-30 second bursts until fully melted. this can cause the bowl to crack or break. Bowl will be HOT use a mitt ! 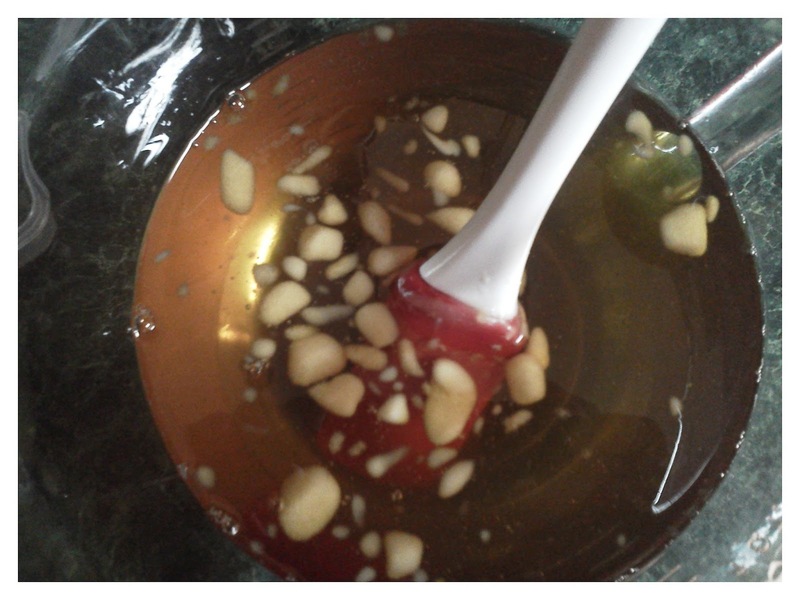 Above: you see chunks of cocoa butter and beeswax floating in oil. Cocoa butter will give you a little harder bar which is good for a massage lotion bar. Above: you see the beeswax floating in the heated oils. Stir, stir, stir. Stirring causes the solids to melt in the heated oil. Stir well. Pour into your molds or tubs. These cool down quickly and harden into lovely solid lotion that you pop out of their tub or mold and smooth over your skin. I pour mine into these 2 oz tubs, they are easy to store that way. These bars will melt if left in a hot car, if that happens just put them into the frig for a few minutes, no harm done. There are wonderful variations of this recipe that you can design yourself, this is a good starting point as the oils are easy to find in your local stores. I have to tell you though, that cocoa butter is fabulous in solid lotion bars. You can buy it online. I got mine at Brambleberry, which is where I purchased my essential oils. I also find great deals at Piping Rock. 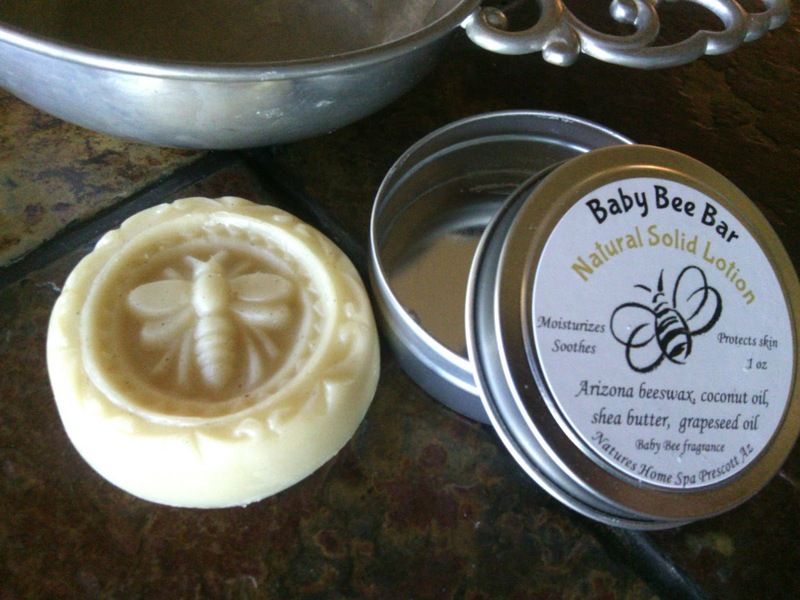 You can find beeswax there also if you cannot find it locally. 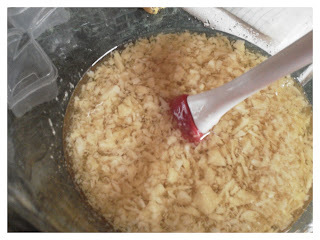 NOTE: if you are using Shea Butter, melt the beeswax and coconut oil first, then add the shea and stir it in. Shea is a finicky butter, it does not like to get over heated, it will turn grainy. Still perfectly good to use if that happens, just not as smooth. 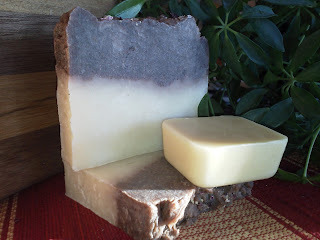 Above: you see a soap bar scented with Brambleberrys "Relaxing" fragrance oil blended with patchouli essential oil, and a matching solid lotion bar of the same scent. Incredibly lovely. Any questions, feel free to leave a comment. Mind Body and Sole's "Wild Crafting Wednesday"
I have purchased several of these bars in the past. I still have some of them, partially used. The scents have all evaporated. Can I melt them down and add more essential oils to give them new life? Will they reharden properly? Just wondering. Thank you. Lotion bars are wonderful. I have always used coconut oil, cocoa butter and beeswax. Never even thought of using coconut oil as the hard oil/butter. My relatives also love the lotion bars I have made them. My father-in-law who has psoriasis have beautiful skin after he started to use a lotion bar. He has used cremes that different doctors have prescribed, but they have never helped. Savannagal, I would have to say yes, you can melt them down and add a few drops of essential oils. I've done the same thing when I just didn't like the scent or it wasn't strong enough. I've even combined several small used bars to make one regular sized one! They are hard to use when they become chips, so I just put them together in one tub and melt them together. They harden just fine. I used a microwave,Worked for me! Hi Kirppu, Normally I use coconut oil, grapeseed oill, cocoa butter and beeswax too, but to make the basic recipe easy for the first time lotion bar makers I chose oils that were easy to get locally! I love my cocoa butter! The grapeseed makes a very non-greasy bar as it permeates skin quickly. That is great that your father-in-law has found relief with your lovely lotion bars! 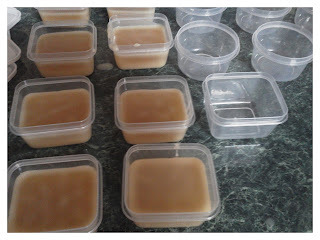 I make these for my 1 year old grandson who has terribly dry skin, it is so gentle and nourishing. just lovely. Thanks for stopping by! Is 10-15 drops for 9 oz or 2 oz? I have been making unscented bars but was recently asked to make rose scented. I have rose in jojoba, I added quite a bit, and no scent when solid??? Lisa, I used 10-15 drops in the 9oz recipe. But usage varies on the strength of the fragrance oil you are using. With some of my scents, like Tangerine, I had to use that per 2 oz! You can remelt your solid rose lotion add more scent and repour. This will not effect the lotion bars. Thank you, I will go thru that process tonight. I have learned a lesson, make one to test before I make more! I got some weird error message and didn't think the message went thru. I made some bars with cocoa butter, coconut oil and beeswax, 1:1:1. They are so hard that they really don't melt on the skin. I want to melt them down, add some more coconut oil perhaps and try again? Think that would be best? Or maybe more coconut oil and more almond oil? 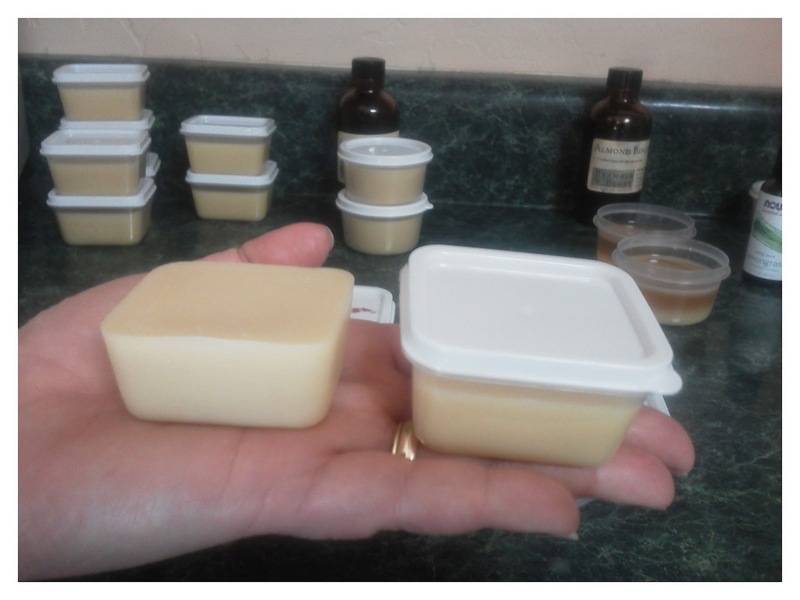 Hi Michelle, I've found that when making a solid lotion bar, to make it melt nicely it works best with 1 solid oil or butter, 1 liquid oil, and the beeswax. In your recipe the cocoa butter and coconut oil would be considered a solid, so you need a liquid or soft oil. I would melt them down again, and add the almond oil. Grapeseed oil is a great liquid oil to use too as it absorbs quickly, which makes for a less greasy feel. Sounds like you made a massage bar, which by design is harder so you can rub the butters and therapeutic essential oils into muscles. Great post. 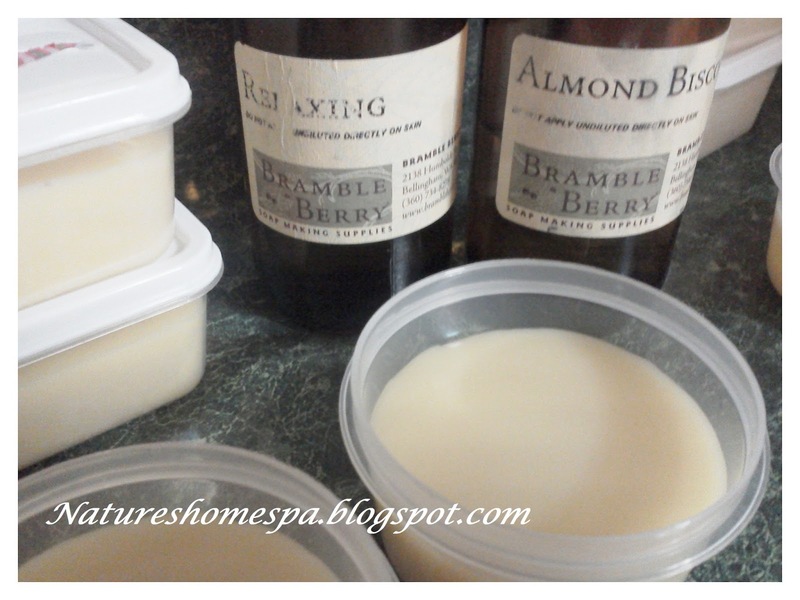 I love making these lotion bars. So convenient and great for our skin. Congrats on being chosen as a featured post on this week’s Wildcrafting Wednesdays! I hope you'll join us again and share more of your awesome posts. Love these lotion bars. Thanks for the recipe. Where do you purchase the 2 ounce tubs to put them in? Thank you! Hi Michele, I get my 2 oz lotion bar tubs at our local Dollar Store, they come in rounds and rectangular tubs. Very good quality for the price and are BPA free. You can even remelt your lotion bar in the microwave if you needed to in these. Hope you can find them in your local 99Cent store as well! Fantastic post. i have been making my own lotion bars for some time now, i was wondering if i could use Soy wax instead of beeswax? i got some from bulkapothecary.com/categories/massage-oil-lotion.html and wanted to give it a try, but thought i would ask first. What about a combination of equal parts cocoa butter and mango butter, avocado (or grape seems Oil) and beeswax? feeling if you have too much. A little goes a long way. the skin. It just depends on what you like. works for you and your skin type! you'd like and I'll share it here on the blog! I use the same round and rectangular tubs that you use. The Dollar Stores are great for this kind of thing, but I saw that you had a label on your round tub. Do you have a program or free download for those label size? For both the round and rectangular ones? I buy Avery Round Labels 22807, glossy white, 2" diameter for the round tubs, fits perfect. You can buy Avery labels in office supply stores, and some Walmarts carry them. Also find them on Amazon. They have free, easy to use templates that you can go right to their website and design and print from your printer. I don't have a good fitting label for the rectangular tubs, so I don't really use them anymore. Just using the round ones. Hope this helps! I know what a pain it can be to get good fitting labels! I'm new to this so sorry if posted twice but was wondering if you had any tips on how to turn a store bought cream into a more solid form like a glue stick or deodorant? Because as weird as it sounds I use hemorrhoid cream for rashes bites and slight burns like popping oil on my hands or arms but I don't particularly like cream and wanted to know if I could get it to a more solid form like a glue stick or deodorant so I can just roll it on and carry it more easily in a purse or bag... any tips or help would be awesome..I thought of just using the beeswax and adding in the cream but I'm not sure if that would work with out other stuff needing to be added. MaryAnn, wow great question. I honestly have never tried using a commercial cream as the base for a lotion bar. They are two different products. You would be "messing" with the stability of the cream, and I'm thinking you'd get separation. What I'm thinking is you should design your own lotion bar with the properties you love in your cream. With a little research, gather a list of oils, butters, essential oils and botanicals (to infuse in your liquid oils) that have the properties you desire to help with rashes, bites and burns. Combined with the beeswax you would have a fantastic solid lotion! If you need help with the recipe, let me know. Best of luck, let me know how it comes out!